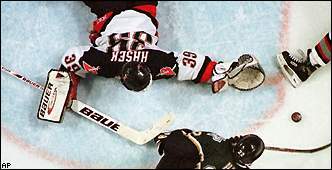 Going by the rulebook in 1999, this Brett Hull goal on Dominik Hasek shouldn't have counted. This week, we're out to find the worst calls by officials, umpires or referees in sports history. Check out our top 10, then have a look at the readers' choice. Friday, we'll run the poll results and crown the worst call of all-time. In arguably the most controversial call in World Series history, Don Denkinger calls the Royals' Jorge Orta safe at first base in the ninth inning of Game 6 of the 1985 Series against the Cardinals. TV replays show that St. Louis pitcher Todd Worrell had clearly beaten Orta to the bag, but Denkinger's call sets the stage for a two-run Royals rally in a critical 2-1 victory. Kansas City goes on to win the Series in seven games. Colorado comes from behind to beat Missouri 33-31 in 1990, scoring the game-winning touchdown on "fifth down." Officials fail to count a down when the Buffs spike the ball to stop the clock and mistakenly give CU five cracks at the end zone. Colorado's score comes on the final play of the game. The U.S. men's basketball team suffers its first loss in Olympic history when officials put time back on the clock twice in the final seconds, allowing the Soviet Union to score a basket at the buzzer and win the gold medal with a 50-49 victory in the final of the 1972 Games. The Yankees beat the Orioles 5-4 in Game 1 of the 1996 ALCS when 12-year-old fan Jeffrey Maier reaches over the fence and catches Derek Jeter's flyball to right before Baltimore right fielder Tony Tarasco can make a play. Umpire Rich Garcia, who has run out to the right-field wall, fails to call fan interference on the play and rules the ball a game-tying homer. The Yanks go on to win the game on Bernie Williams' homer in the 11th. In a play that will live in Buffalo infamy, Brett Hull gives the Stars the Stanley Cup when he beats Dominik Hasek for the series-clinching goal in the third overtime of Game 6 of the 1999 finals. Of course, every Sabres fan in the universe has been screaming ever since about how Hull's skate was in the crease before the puck, but the refs fail to make the call or ask for a replay. Before the next season, the NHL will change the "skate-in-the-crease" rule in reaction to the play. 6. Maradona's "Hand of God"
In what Argentinians refer to as the "Hand of God" goal, Diego Maradona rises up between two defenders and punches the ball into the goal to help Argentina beat England in a 1986 World Cup quarterfinal. The referee doesn't notice the hand ball, and the goal stands. Maradona gives the play its name later when he says the goal was scored "partly by the hand of God and partly by the head of Maradona." The easiest call in any football game is the coin flip, right? Well, for referee Phil Luckett, the coin flip is a nightmare during a 1999 Thanksgiving Day game between the Steelers and Lions. As the game goes to overtime, Steelers captain Jerome Bettis calls "tails," but Luckett hears "heads." The Lions win the toss and go on to win the game. The NFL will change its procedures for the coin flip after the snafu on national television. Officials rule Houston wide receiver Mike Renfro is out of the end zone on a fantastic catch at Pittsburgh in the 1980 AFC championship game. Replays show Renfro was in-bounds, but officials rule the pass incomplete, and the Steelers go on to a 27-13 victory that sends them to their fourth Super Bowl. Umpire Eric Gregg rings up Fred McGriff to end Game 5 of the 1997 NLCS on a pitch from Livan Hernandez that appears to be a foot outside. The Marlins beat the Braves in the series and go on to win the World Series. USC beats Michigan 17-10 in the 1979 Rose Bowl, thanks to a controversial ruling on Charles White's 3-yard TD run in the second quarter. Just as he is entering the end zone, White is hit hard and loses the ball. Wolverine linebacker Jerry Meter comes up with an apparent fumble recovery on the 1-yard line. However, the line judge determines that White had crossed the goal line before losing control of the ball and signals for the touchdown -- the score proves to be the difference for the Trojans. Jerry Rice is ruled down before fumbling against the Packers in a 1999 NFC wild-card game. Replays show the play was indeed a fumble, and the 49ers go on to win the game on Steve Young's dramatic TD pass to Terrell Owens as time expired. Michael Jordan pushes Bryon Russell on the final shot of his career in Game 6 of the 1998 Finals, which lifts the Bulls over the Jazz for their sixth NBA championship. Bert Emanuel's apparent first-down catch late in the 2000 NFC championship game is ruled to have hit the ground -- although replays show the ball was clearly in Emanuel's grasp when it touched the turf. Emanuel's Bucs lose 11-6 to the Rams. With the Patriots up by three points in final two minutes, referee Ben Dreith calls roughing the passer on New England's Sugar Bear Hamilton after he hits Oakland QB Ken Stabler in 1976 NFL playoffs. Raiders go on to score a touchdown in the final minute to win 21-17, and go on to win the Super Bowl.